I’ve made another video to go along with this blog post. You don’t have to read the post if you don’t want to - you can scroll right down to the video and watch it instead. 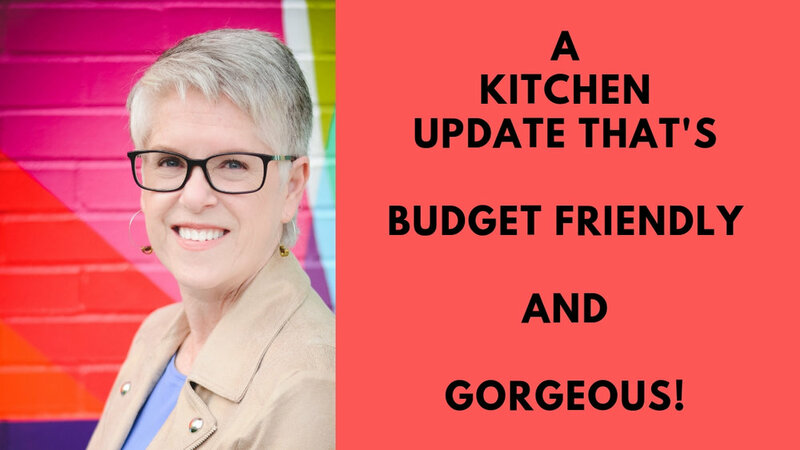 I helped Lisa update her tired Kitchen on a strict budget. You’re going to enjoy this one because it came out just the way we all hope our semi-DIY projects will—successfully! 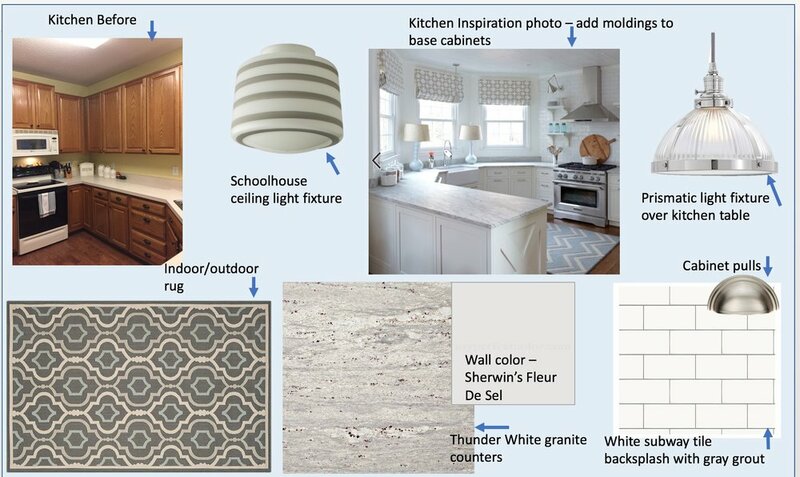 I gave her direction: resources (people to call, websites to visit, paint color suggestions, lighting ideas and technical advice. She handled ALL the project management, which is not easy. Buying and coordinating the delivery and installation of every element takes a lot of determination and the patience of a saint. But she did it! Next is the concept board that showed how her selections were all going to play together very nicely. 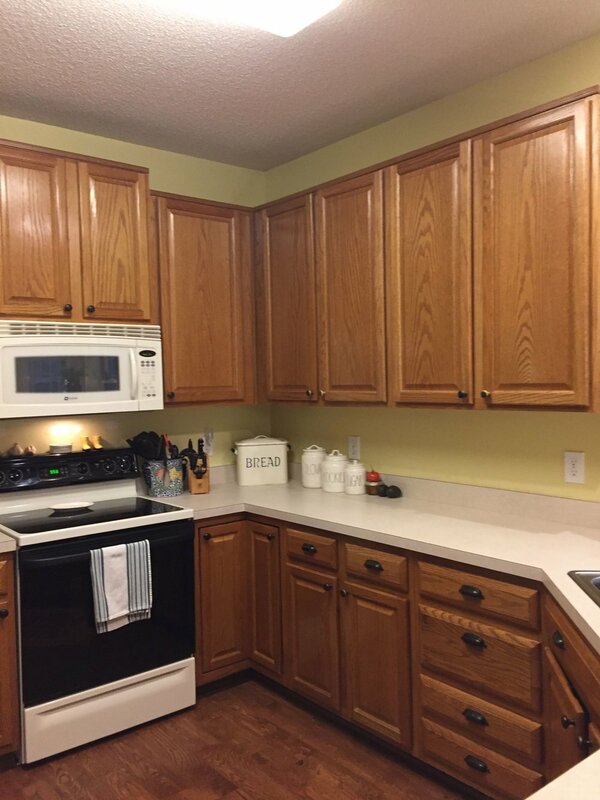 Buh-bye dated kitchen. Now this is what I would call a remarkable transformation! White cabinets against warm brown hand-scraped floors may be termed “farmhouse” right now, but this is a classic look that will stand the test of time because every element is gorgeous. 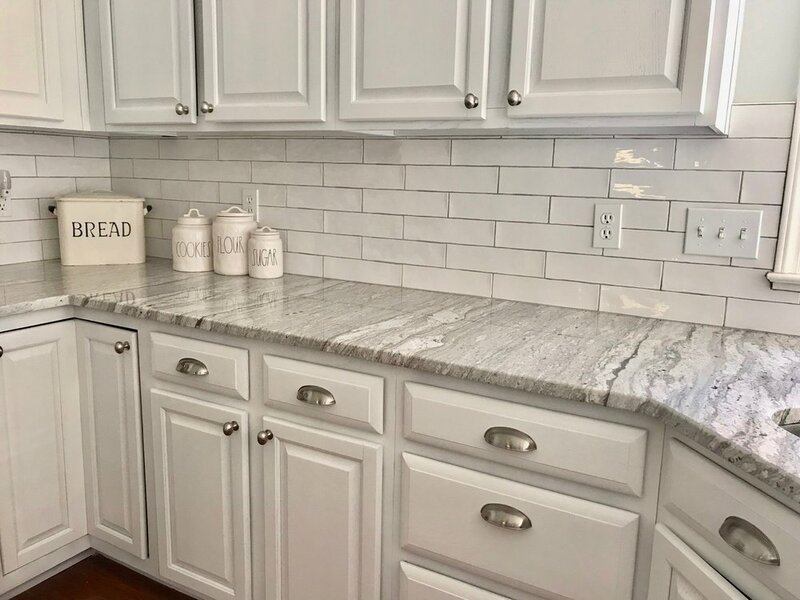 Those elongated subway tiles are hand-made, taking the sharp edge off the look of a basic white subway tile. I bet Lisa runs her hands over those tiles on a daily basis (okay, maybe weekly). The next photo is a Before of the peninsula. Just your standard flat wood back. What a difference, right? I can’t pick which new addition is my favorite, but this has got to be near the top of my list! The sweet roman shade window treatment came from an Etsy vendor. Don’t you just love Etsy? It’s becoming a regular shopping site for absolutely everyone! Oops! Did I forget to call out the new Thunder White granite counters? They’re hard to miss! Gorgeous, gorgeous, gorgeous. Lisa is a big Rae Dunn pottery fan. 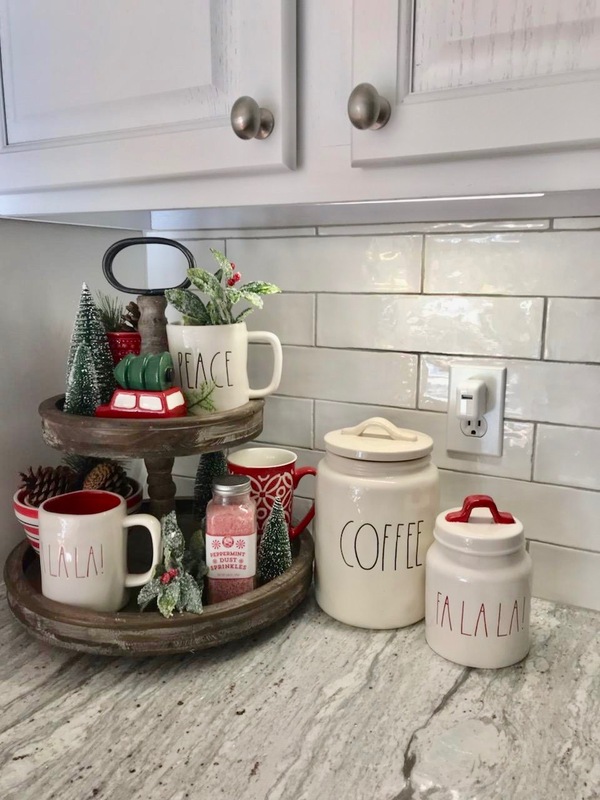 On the other side of the kitchen there’s a counter that serves as the coffee station, but Lisa also likes to decorate it for various holidays with pieces from her extensive collection. Such a welcoming kitchen! Jeez, I almost forgot to insert the video I made of this project. Here it is. Enjoy! I haven't had a chance to post on the blog lately, so when I received a request from a moving company called Bellhops to write post for me, I was all ears! While I haven't worked with this company yet, I checked them out and was impressed. 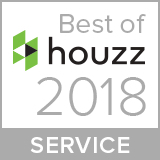 They're a moving company with a very updated vibe, and, since moving is something that many of us have done (and sometimes many times), I thought you would all enjoy hearing what they have to say. So here it is! One of the best things about moving into a new house is making it yours. Take the opportunity to flex your creative muscles and decorate in the style you’ve always wanted. Whether it’s a fixer-upper or turn-key ready, there are an endless amount of things you can do that can transform a house into a home. A fresh lick of paint has the power to quickly start putting your stamp on your new space. If you just want a quick freshen, go for colours like white, creams or greys. Neutral palettes give a clean, crisp base to build upon. But, saying that, a bit of vibrancy is always a good thing. Colour is a powerful tool. Colours can influence our emotions and perceptions, so this is an opportunity to try some out. Do a bit of research into your favourite shades and see if they match the vibe you want your home to have. If you are game to take some risks, and are thinking about bold or unusual colour combinations then you should go for it! However, before you commit to something like a fuschia kitchen, it’s always advisable to chat to an expert first. They will be able to advise you on what will suit the shape, size or style of your rooms. A professional will work with you on all the different factors that determine what will work best. Unless you are super minimalist, you’ll probably want to make your new home as cozy as possible, as quickly as possible. And when it comes to comfort, little things can make a huge difference. Treat yourself to things like a new set of mugs and everyday glassware. New dish towels for sure! Candles, cushions and throws will all add to the ambiance. A gorgeous new table lamp or light shade works wonders for creating a warm atmosphere. Maybe most important are your prized possessions. Hang your photo frames, wall art and mirrors straight away and it will really start to feel like home. It’s tempting to unpack the things you need and ignore the rest. But you will never feel truly settled if you ignore stacks of boxes. Set aside time to properly sort your stuff. Find a home for everything you want to keep and sell it or donate what you don’t. It’s always best to eliminate clutter from the start. This will help you to keep your new place clean as you go on too. Storage is essential. There are so many inexpensive solutions available these days, not just closets, but storage boxes, shelves, drawers, stackable containers. There are loads of awesome hacks out there that help to make the most of your home. They say home is where you lay your head down at night and so a bed is one of the most important things in any house. If you have brought your own, maybe it’s time to think about an upgrade and if you have moved into somewhere where your bed no longer fits, it's time to go shopping! When decorating your home, there will always be things you will want to add to and tweak as time goes on. But tackling the bigger things and creating an inviting environment is best done at the beginning. Then you can spend your time exploring your new neighborhood! I hope these tips are helpful and that you'll consider Bellhops for your next move!